Designed by Valentina, for the legendary Katharine Hepburn. From the Estate of Katharine Hepburn. The ensemble fashioned of soft cranberry crepe silk was tailor made for Ms. Hepburn by Valentina and designed to be worn during the day or entertaining at home. Styled in Valentina's signature monochromatic style of cranberry crepe silk offset by white piping accent at collar and cuffs. The Jumpsuit is reminiscent of an aviator's suit, recreated with touches of femininity in the tulip style breast pockets and a most dramatic signature Valentina keyhole back. Shoulder pads for definition and balance and matching bodice and hip plackets to emphasize stylish detail. 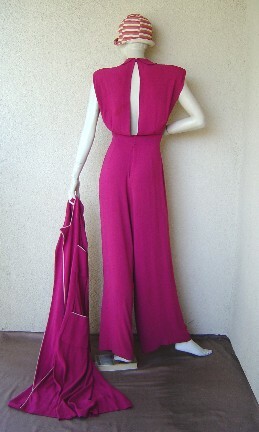 Attached belt for waist definition and the wide leg pants that give the illusion of a long evening dress. Valentina's signature matching wrap-a-round belted coat is simple, elegant and functionally designed with four (4) pockets and attached belt that ties on side. Man tailored yet with a touch of femininity. Both pieces unlined with painstaking hand detail and finished seams with all the hallmarks of fine couture detailing and sewing. Condition: Excellent. Valentina labels in both jumpsuit and coat. Katharine Hepburn was, and is, a beloved Hollywood legend. Her stage and screen career spanned seven decades. Born in 1907 in Hartford, Connecticut, her father was a doctor and her mother a suffragist, Hepburn died in 2003 at her home in Old Saybrook, Connecticut, at the age of 96. She was the winner of 4 Academy Awards and was nominated for 12 Oscars. As a Hollywood icon Katharine Hepburn not only made wearing pants acceptable, she made it fashionable. In many ways, Hepburn was instrumental in redefining femininity, causing a fundamental change in fashion ... away from the shaping and draping of the feminine form towards the creation of a feminized masculine silhouette. "In 1930, she wore pants and suits considered scandalous; today, they are sensational," said designer Calvin Klein, honoring Hepburn with a lifetime achievement award from the Council of Fashion Designers in 1986." "They have prompted generations of fashion designers to capture her vitality and spirit." Valentina Nicholaevna Sanina (1904 Kiev, Russia - 1989, New York City) was "Often called America's most glamorous dressmaker she was recognized to be one of the United States' top couturiers and theatre costume designers." (St. James Fashion Encyclopedia pg 391). "One of America's few resident couturiers -- perhaps the only one who can be mentioned in the same breath as Mainbocher and Charles James...". (Couture The Great Designers by Caroline Milbank pg. 177). Valentina had an elite and private clientele of faithful devotees from the opera, theatre, movies and New York society. She became famous by designing costumes for Katharine Hepburn for the original theatre version of "The Philadelphia Story" on Broadway in which Hepburn starred in 1939. In fact, five years after the play ended Valentina continued to receive large orders for clothes just like the ones worn by Ms. Hepburn in the play. Valentina Gowns, Inc was established in 1928 on New York's Upper East side. All Valentina's designs were created and overseen solely by her to the last detail and for this reason her fashions were available only through her own establishment (however, she did enjoy a brief association with I. Magnin). Valentina's business flourished for 30 years, patronized by the fashionable and wealthy. A Valentina fashion today is quite rare, as nothing was mass produced and her designs were coveted by a select elite. Valentina is a much sought after label, representing superior and couture sophistication and style. Prominent museums such as The Costume Institute at the Met possess Valentina designs in their permanent collection. 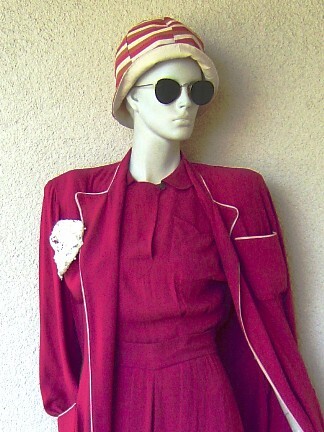 This Katharine Hepburn/Valentina jumpsuit and coat is from The Estate of Katharine Hepburn. Authenticity guaranteed. Documented. Full and complete description, information, condition report, documentation and additional photos available to serious collectors and museums upon request.